The terms “paralegal” and “legal assistant” have been used interchangeably over the years and with good reason. These legal professionals perform similar duties within a law firm, and they're often referred to in the same context in legal decisions handed down by courts. Court rules don't differentiate between them and bar associations rarely distinguish between the roles when setting rules for practice. That said, paralegal assistants and legal assistants should not be confused with legal secretaries who generally do not share the same responsibilities. What Is a Paralegal Assistant? The term "paralegal" is widely understood to describe a person qualified through education, training, or work experience to perform substantive legal work under the guidance and supervision of an attorney. The same often applies to legal assistants, but the National Association of Legal Assistants made a distinction between the two roles in 2004. 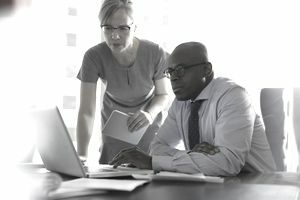 The two terms—“paralegal” and “legal assistant”—are still used interchangeably in the legal industry, but the growing trend is to use the title of “paralegal” for certified employees. Paralegals and legal assistants perform many of the duties an attorney would have to take care of personally if he did not hire such a professional. They do legal research and draft pleadings, contracts, leases, and other court and legal documents. They help with trial preparation and can usually assist clients by answering many of their questions. However, they cannot give legal advice or guide clients toward one course of action or another. In addition, they cannot sign pleadings or other documents, which must be reviewed and signed by the attorney. Most lawyers bill their paralegal's or legal assistant's hours to their clients, just as they would bill their own time, but at a lower rate. For example, they may bill $100 an hour for the paralegal's or legal assistant's time and $300 for their own. Paralegals and legal assistants do not receive this money directly, however, as they're typically paid set salaries through the firm. Many law firms call their legal secretaries “legal assistants” so they can justify billing clients for these employees' hours as well, but the duties of a legal secretary are typically more limited. They may draft correspondence and usually organize files and perform word processing, transcribing the attorney's dictation from audio devices and following his directives for other tasks. They take phone calls but are not usually entrusted with answering client's questions. More commonly, they'll draft those questions in a memo which is passed on to the attorney so he has a full understanding of the client's concerns and needs when he returns calls. Legal secretaries set appointments and calendar court appearances and events in each case. They may also take care of other administrative tasks, such as billing clients. Most law firms use the terms "paralegal" and "legal assistant" to avoid confusion with secretarial and other legal support roles.